Hushmoneygate? Stormygate? Whatever. It’s Getting Deeper, Faster. The lawyer, Michael Cohen, established Essential Consultants LLC, on Oct. 17, 2016, just before the 2016 presidential election, corporate documents show…. [To] mask the identities of the people involved in the agreement, the parties used pseudonyms, with [Daniels] identified as “Peggy Peterson,” according to a person familiar with the matter. Part of the draft settlement pact was published by Slate. Let’s just repeat this: Trump’s lawyer paid hush money to a former mistress in the middle of a presidential campaign. But Trump refuses to talk about this and Cohen refuses to tell us where the money came from. How is it that the Wall Street Journal is the only paper chasing this story? “Yep,” the other consultant replied. “She says one time he made her sit with him for three hours watching ‘shark week.’ Another time he had her spank him with a Forbes magazine.” Dubé and the other consultant confirmed to Mother Jones they exchanged these emails. 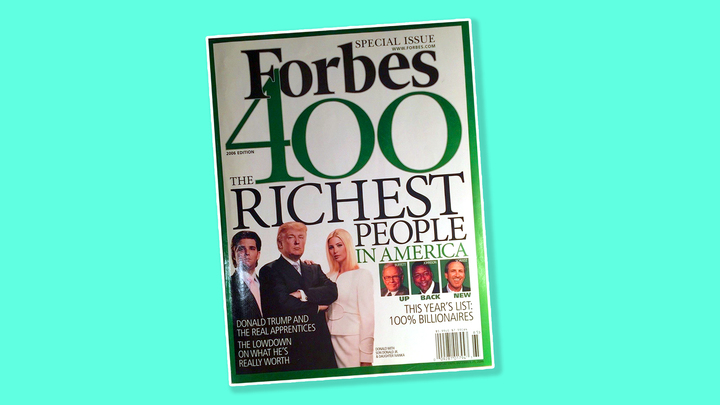 A fall 2006 cover of Forbes does feature Trump and two of his children, Donald Jr. and Ivanka. Really, Donald? Such a naughty, naughty boy.